the best of both worlds: exquisite, florist-designed arrangements individually created by some of the nation's top floral artists and hand-delivered the same day, and spectacular flowers shipped overnight. $0 cash back on purchase of alcohol related items, popcorn cards, or cookie cards. 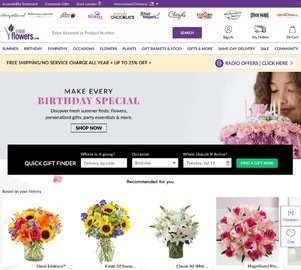 Click a Coupon or click Start Shopping to earn 4% Cash Back at 1800FLOWERS.